Who doesn’t love party mix? This crispy, crunchy version spiffed up with North Carolina’s Bone Suckin’ Sauce & Seasoning won’t last long, so make bunches! 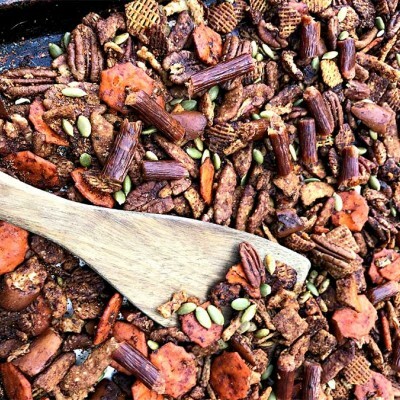 Combine all party mix ingredients in a bowl, except pumpkin seeds and Slim Jims. Melt butter in microwave (about 1 minute). Stir in sauces. Pour over mixture and toss with hands until everything is coated. Place large baking pan into oven on middle rack. Put half of mixture on pan and bake about an hour, tossing every 20 minutes. Remove from oven and spread on parchment paper to cool. Scatter with pumpkin seeds and Slim Jim pieces; shake on seasoning. Repeat with the other half. Store in airtight container.